In their first few months, your baby will experience a lot of changes in their mental development. It’s during this time that they will learn the basics of sight, smell, touch, language, emotion and communication. As parents, we want to see our children thrive, and there are several ways in which we can encourage our newborns to develop. One of the best ways to bond and encourage emotional development is to talk and engage with your baby. From the moment they’re born, be sure to hold them close, talk to them and give them as much human contact as possible. It may feel silly engaging them in full conversation, but they will and love listening to the sound of your voice. After a few days, they will begin to slowly recognise the different tones of your voice and they will learn to interact with you in their own way. Eventually, their eyes will be able to track your movements and body language. These early days are key for your baby’s language development, as the sounds that they hear will provide the foundations for the basic and distinct sounds of their native tongue. Let them experience different things. Surround your baby with lots of interesting toys and textures. Hang a vibrant mobile above their crib or changing table, or even create your own floor gym. 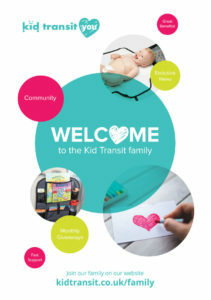 Let them reach out for the colourful designs and objects and touch different textures and surfaces. You could also safely take their hand and rub it gently on soft, smooth, rough, cold and warm objects. Meanwhile, mirrors are an incredible way to enhance their cognitive development. Seeing their own reflection will get them to recognise human faces, as well as interact with themselves. Place an unbreakable mirror next to their cot, or prop one up alongside them as you change them. 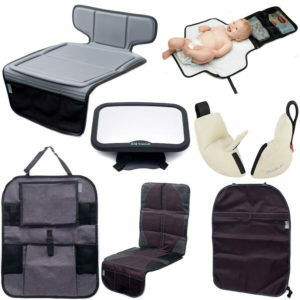 Additionally, our baby car mirrors double up as peace of mind for parents and a stimulating toy for babies. To find out more about our mirrors, visit our Baby Car Mirrors product page. Alternatively, check out our blog post all about the benefits of owning a baby car mirror. As well as talking to your baby, it’s also important to introduce them to music. Sing to them when you’re with them so that they can explore the sense of sound. After a few days, your baby will be able to respond to high-pitched and loud sounds. Toys that make a pleasant noise when they’re touched can be great for introducing your newborn to new sounds. Research shows that newborn babies thrive when they’re around caring humans. So, make sure that they have as much human contact as possible in their first few months. Enjoy yourself too whilst bonding with your baby, these early months are very special and should be cherished. 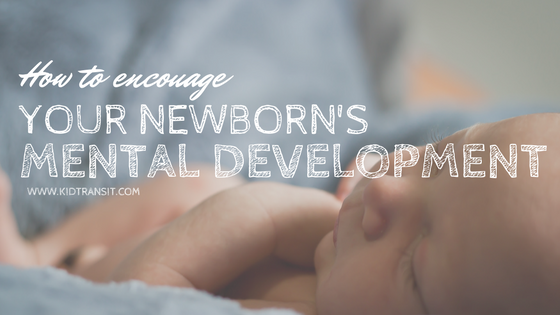 Do you have any tips to share on encouraging a baby’s development? Let us know in the comments below or on Twitter and we’ll add them to this article.